Labeling shapes stops you from seeing, my abstract work is the whole collection of shapes, it is a whole being, living. The idea is for it to evoke a feeling of whatever it is that is evoked in you, not what I was trying to tell you to feel, or what a small label might have you feel, but an overall feeling, a reflection of your own internal world. Lets say the work is in a language you don’t know and it is somehow expressing to you an experience that is new and that is your own, from inside you. The concept for this exhibition is around the peace and tranquility that the ocean and rivers provide. It’s both exciting and calming, at the same time. This attracts the sense of independence and the satisfaction of being cut off from the outside dramas of a wider-world creating, through the sometimes abstract composition, the illusion and sense of being in one’s own world ensuring a sense of tranquility. These paintings continue to appeal to both the high number of both fisherman and naturalists and those who like to be at one with the environment. 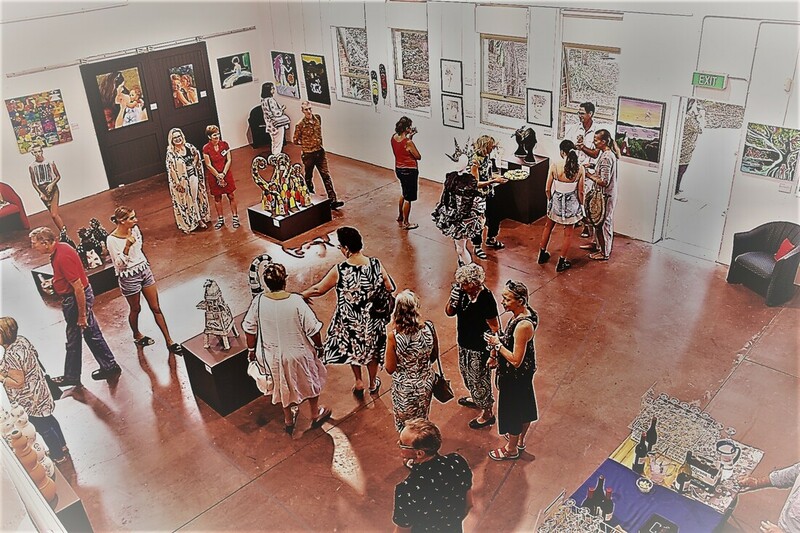 As the Butterbox hosts 'A Real Taste of Noosa' Food and Wine event and Cooroys Fusion festivals' art activites, BFAC’s staff are invited to exhibit to demonstrate BFAC’s behind the scene talents from the peeps who keep the place humming. All with a commitment to their art practice and inspiring the creative community, Behind BFAC showcases a diverse range of works by Alison Mooney, Zoe Martin, Alicia Sharples, Fiona Groom, Micheal Ciaverella, Bron Lawson and Alicia Adams. Images (L-R): Alicia Sharples, Bron Lawson, Fiona Groom, Alison Mooney, Zoe Martin, Micheal Ciaverella and Alicia Adams. JOIN US to celebrate the opening of these exciting new exhibitions.